A lot has been said about the so called ‘Progressive Alliance’ or the anti-Brexit alliance. They have been labelled as the ‘coalition of chaos’ by the Conservatives and some far-right media platforms. While others, like Gina Miller (the pro-Europe campaigner) and Hisham Abdel-Rahman (a Canadian poll expert) have stated that it is the only available option to oust the Tories on June 8th. They have called on the British public to adopt tactical voting in next month’s General Election. However, very little attention has been paid to the Brexit alliance comprising of UKIP and the Conservatives. All over the country, UKIP candidates are standing aside to aide their Conservative counterparts in an attempt to defeat pro-Europe contenders. Two such constituencies include Carshalton & Wallington and Richmond Park & North Kingston in south London where the incumbent MPs are Liberal Democrats. When asked whether the absence of UKIP from the ballot paper will increase his chances of victory on June 8th, Matthew Maxwell Scott, the Conservative Parliamentary Candidate for Carshalton & Wallington, replied ‘probably’. Let’s not be fooled by the aforementioned reply. The UKIP and Tory alliance is only taking place in key seats. For instance, in Carshalton and Wallington, it is only the Conservatives who have an actual chance of defeating Liberal Democrat, Tom Brake. 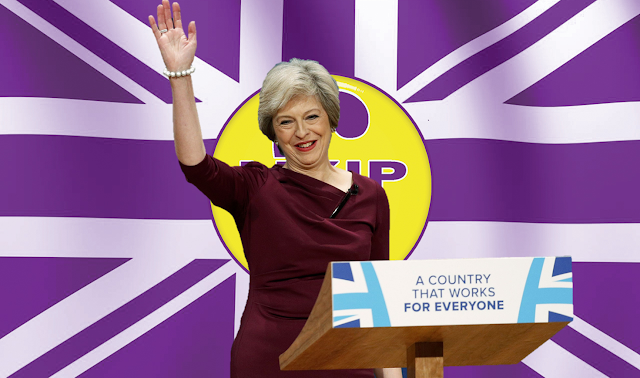 With around 6,000 votes separating the Conservatives and Liberal Democrats at the 2015 General Election, the Conservatives will be delighted that they can count on the approximate 7,000 UKIP supporters in this constituency. This is not just a one-off. The seats where the Brexit-alliance is taking place, the Tories are the only ones who have a realistic chance of defeating pro-European contenders. These are the same seats where the absence of UKIP from the ballot paper will be an overwhelming advantage to the Tories. Let’s make this alliance known for its original purpose: it is a calculated and direct attack on open, tolerant and outward looking people. On numerous issues, the Conservatives and UKIP are one and the same party. From Brexit to immigration they are inseparable in their rhetoric and their policies. This is highlighted by the intention of both parties wanting a ‘hard-Brexit’ and promising an extremely unachievable immigration target. Their policies will damage the UK economy and fuel further xenophobia. UKIP has effectively dwindled out the compassion from the Conservative party and injected it with the old, nasty rhetoric of the 1950s. Beware: a vote for the Conservatives is a vote for UKIP!